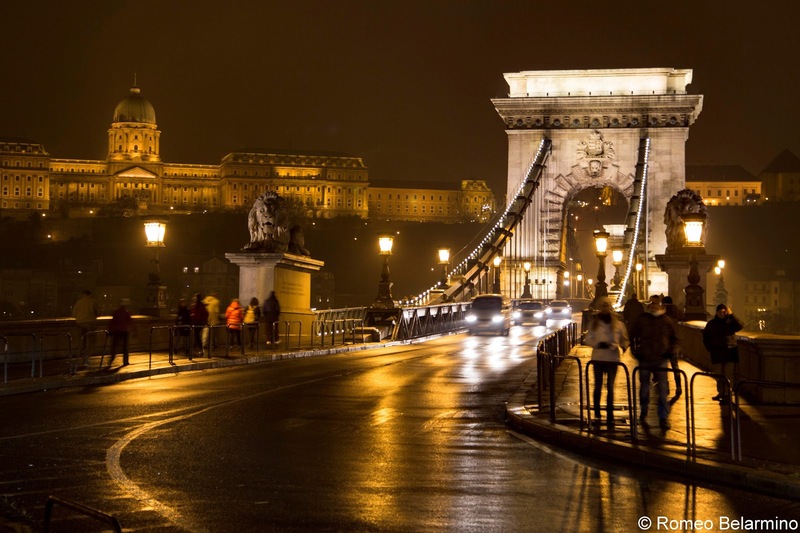 Budapest is a popular starting (or ending) point for European river cruises. We found this out when we passed through passport check at the airport. The gentleman asked if we were traveling for pleasure. When we responded yes, his next question was if we were taking one of those river cruise things. The answer was yes again, as we were embarking on an eight-day river cruise with Viking River Cruises to cruise the Danube and visit cities and European Christmas markets along the way. 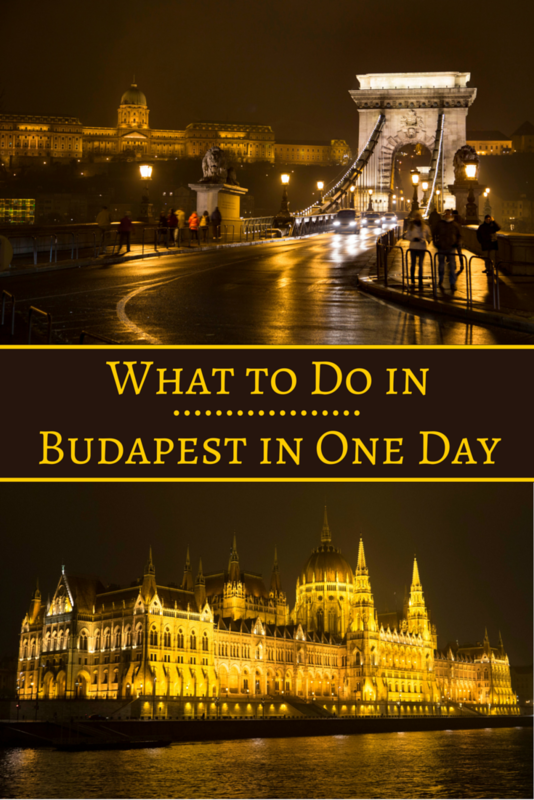 As Budapest was the beginning of our journey, we had 24 hours in the city. While it wasn’t enough time to thoroughly explore, we were able to see quite a lot in one day. 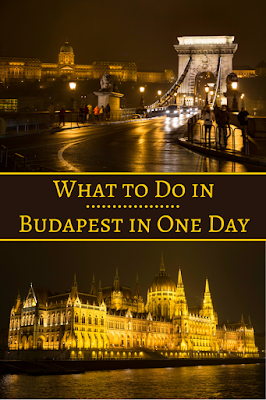 Whether you too are cruising the waterways with a European river cruise, or just spending a short time in Budapest, here is what to do in Budapest in one day. 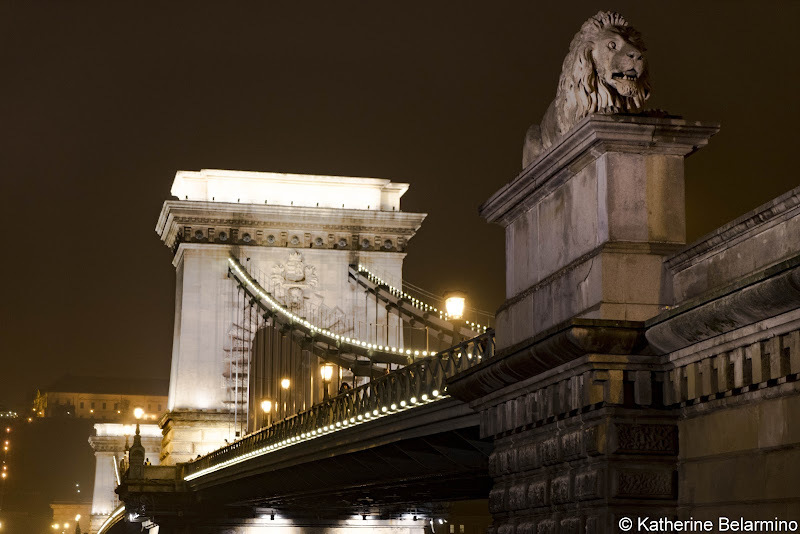 Széchenyi Chain Bridge is Budapest’s famous suspension bridge and a symbol of the city. It was the second bridge to span the Danube River, and the first to span the river in Hungary. It is also, therefore, the first permanent bridge to connect Buda and Pest. Chain Bridge was first opened in 1849 and at the time was one of the longest suspension bridges in the world. Only the towers of Chain Bridge survived World War II. It was rebuilt and reopened in 1949, 100 years after it was first opened. Be sure to look for the stone lions at each end. Andrássy Avenue is a boulevard going through the Pest side of Budapest lined by buildings built in the 1800s. Andrássy Avenue is now a UNESCO World Heritage Site. 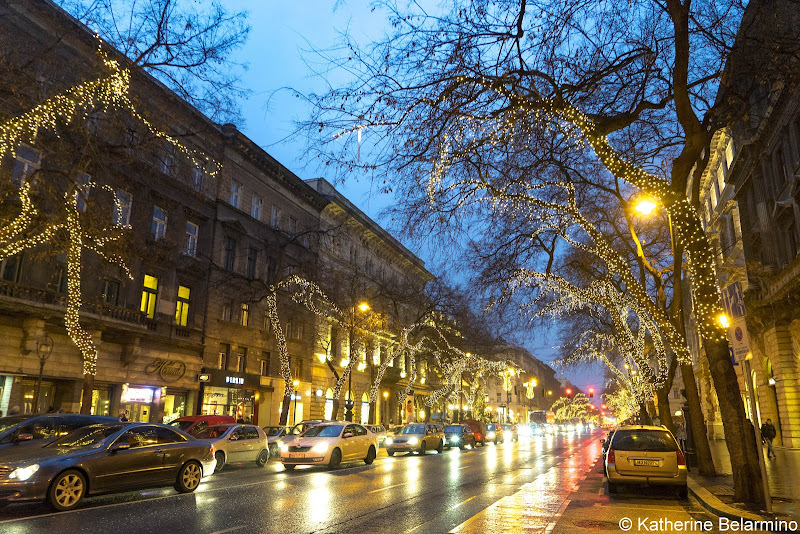 The avenue was inaugurated in 1885, in time for the 1,000-year anniversary of Hungary, which was celebrated in 1896. The Avenue was restored in 1989 with the change to democracy. The Budapest Opera House is on Andrássy Avenue and is believed by some to be even more beautiful than the Vienna Opera House. Another famous building on Andrássy Avenue is the House of Terror. It used to be the headquarters of Nazi party sympathizers and is now a museum recounting the sordid history of this building. In front of the House of Terror is a piece of the Berlin wall and a sculpture of hanging chains, both a reminder of when the country was behind the Iron Curtain. At the end of Andrássy Avenue is Heroes’ Square, Budapest’s largest square. 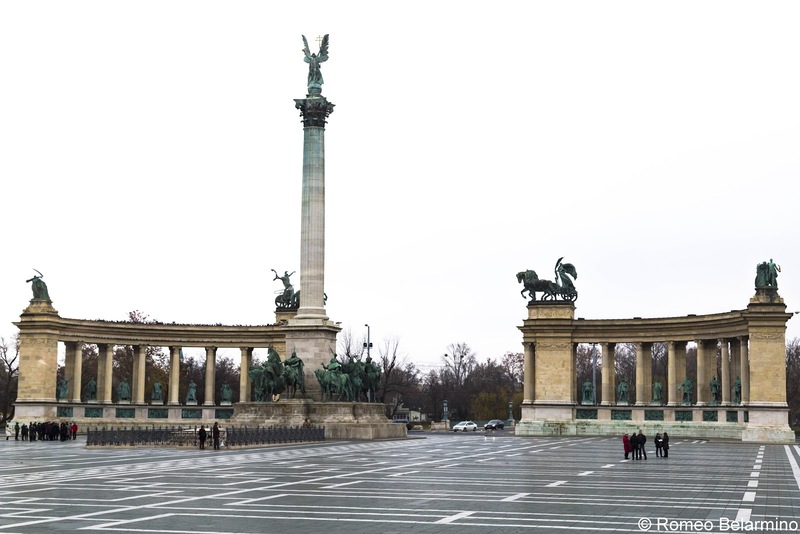 The Millennium Monument, which dominates Heroes’ Square, was built to commemorate the 1,000-year anniversary of Hungary and the Magyars, the Hungarian tribes. Heroes’ Square is overlooked by Archangel Gabriel who holds a crown and a double cross. On either side of Heroes’ Square is the Museum of Fine Arts and Kunsthalle. Something Budapest is famous for is its thermal baths. Unfortunately, with one day in Budapest and Christmas markets to visit, we were unable to partake in this Budapest tradition. But with 24 hours in the city, it is possible to add Budapest’s famous baths to your list of things to do in Budapest, at least for a short time, as they are open late. 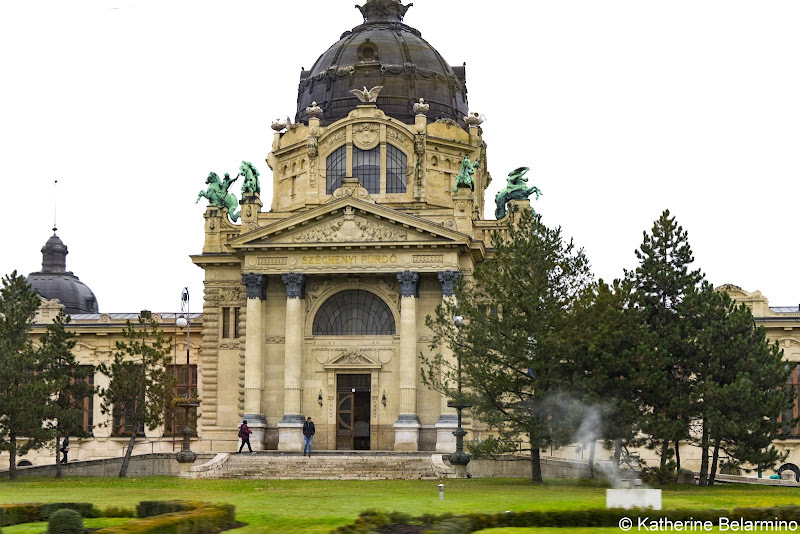 Built in 1913, Széchenyi Baths was the first hot spring bath palace in Pest. Previous to the opening of the bath palace, Hungarians enjoyed the hot springs when deep hot spring wells were drilled under nearby Heroes’ Square and bathers came to the stone-walled bath, then called Artesian Bath, built in 1881. There are multiple baths and pools, and services like massages are offered as well. There are six other thermal baths throughout Budapest as well. When it was built, St. Stephen’s Cathedral was the tallest building in Budapest and remained so until the Hungarian Parliament Building was completed. 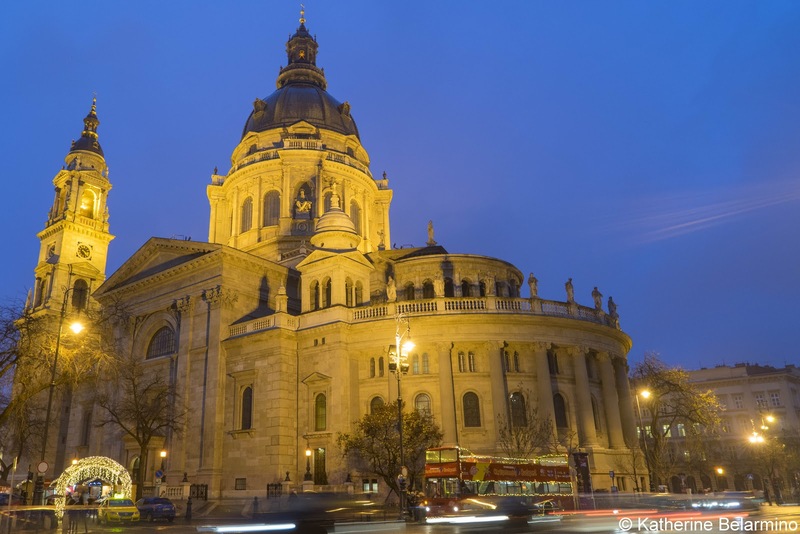 St. Stephen’s Cathedral is named after the first Christian king of Hungary who was crowned in 1000 AD. St. Stephen’s mummified hand is housed in the cathedral. The cathedral is stunning at twilight when the lights cast shadows of the statues on the church. 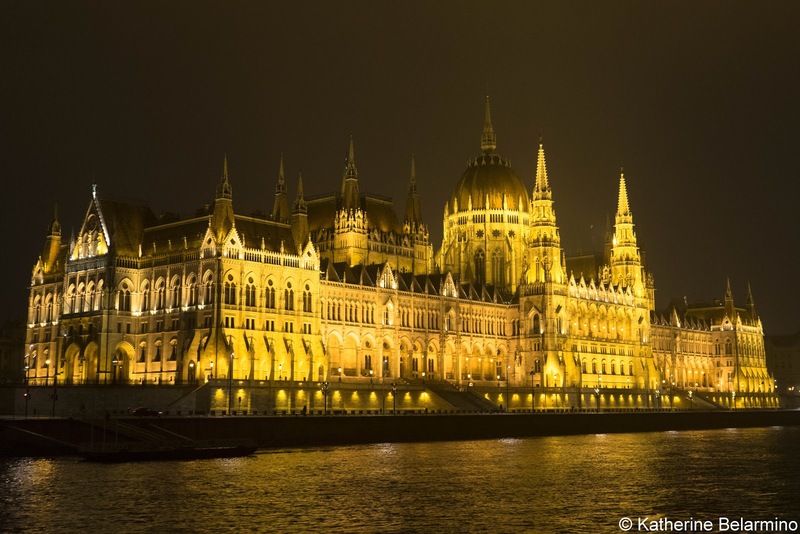 The Hungarian Parliament Building is another of Budapest’s buildings built for the millennial celebrations of 1896. 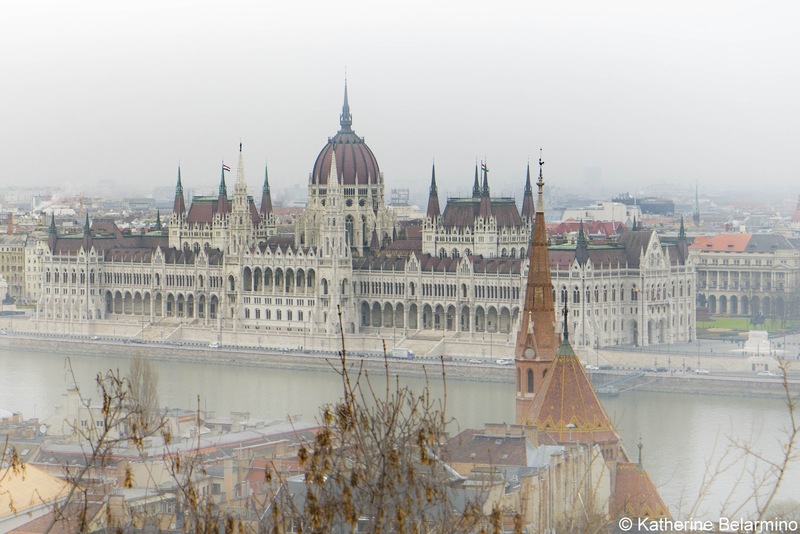 The Hungarian Parliament Building is another icon of Budapest which is found on the banks of the Danube River. It is most beautiful when lit up at night, the view of which can best be enjoyed during an evening river cruise. Sessions of Parliament can be visited with a special ticket and the building can be explored on a guided tour. While walking around the Pest side of Budapest, you might notice it doesn’t have the traditional old town most European cities have. This is because the Pest side is low and flat and a flood in 1830 destroyed everything. On the Buda side, however, your desire for a European old town will be filled with a visit to Buda Castle Hill. Castle Hill can be reached via a funicular or by walking up the hill. Once at the top, wander the cobblestone streets and poke into shops selling local crafts. Castle Hill is another of Budapest’s UNESCO World Heritage Sites. 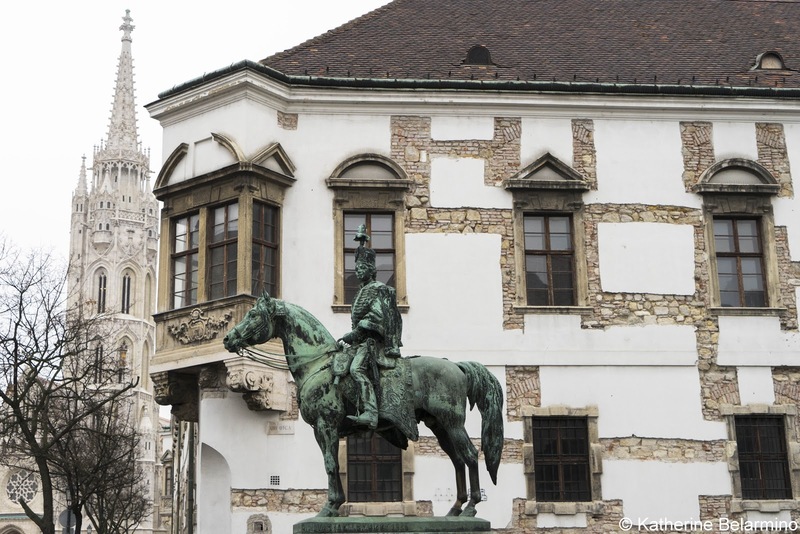 Castle Hill gets its name from Buda Castle, but the castle was gutted during World War II and now houses cultural museums rather than palatial rooms. One of the sites on Castle Hill is Fisherman’s Bastion. Fisherman’s Bastion is a viewing terrace providing a panoramic view of Pest across the Danube River. Modern day Fisherman’s Bastion was built in the 19th century as a lookout tower. Its name may seem unusual since it is far above the water, but it was protected by the guild of fishermen during the Middle Ages. The seven turrets represent the seven Hungarian tribes who founded Hungary in 895 AD. Sharing Trinity Square with Fisherman’s Bastion is the tile-roofed Matthias Church. 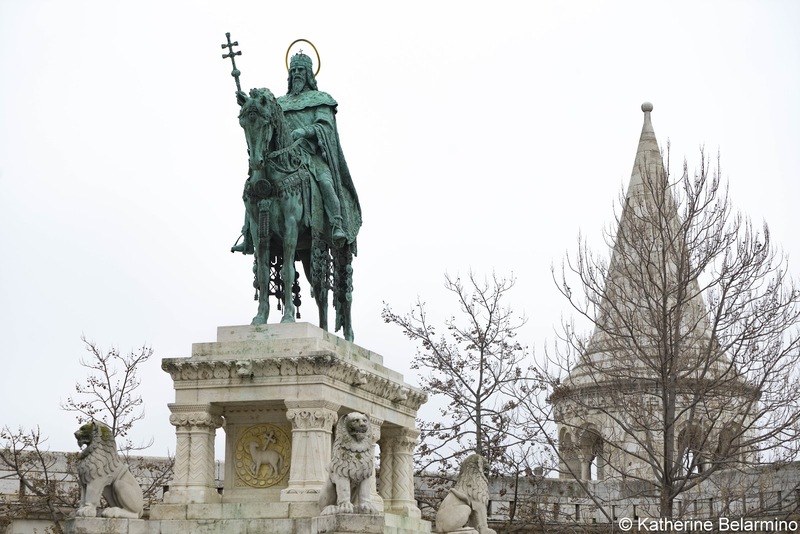 Matthias Church is named after King Matthias, who was married twice inside. Matthias Church is over 700 years old and is one of the oldest buildings in Buda. The colorful tile roof provides a hint as to what will be found inside. 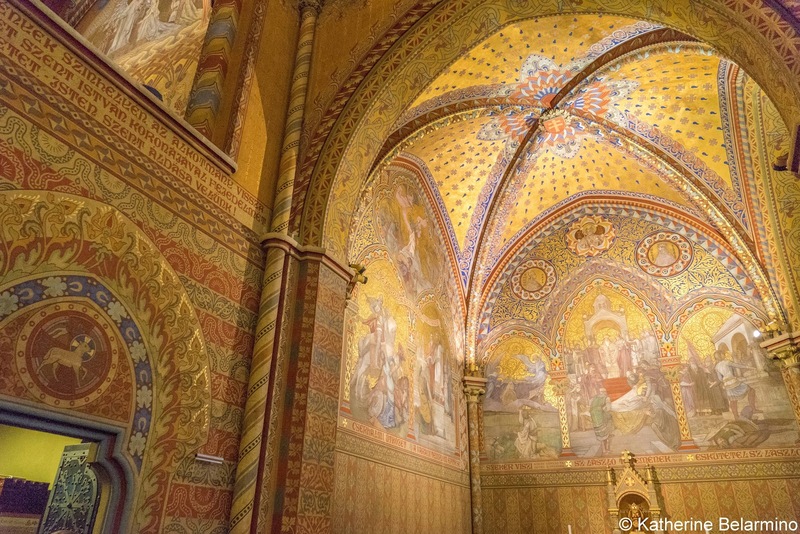 The interior walls of Matthias church are completely covered in rich, colorful frescoes by Hungarian painters. 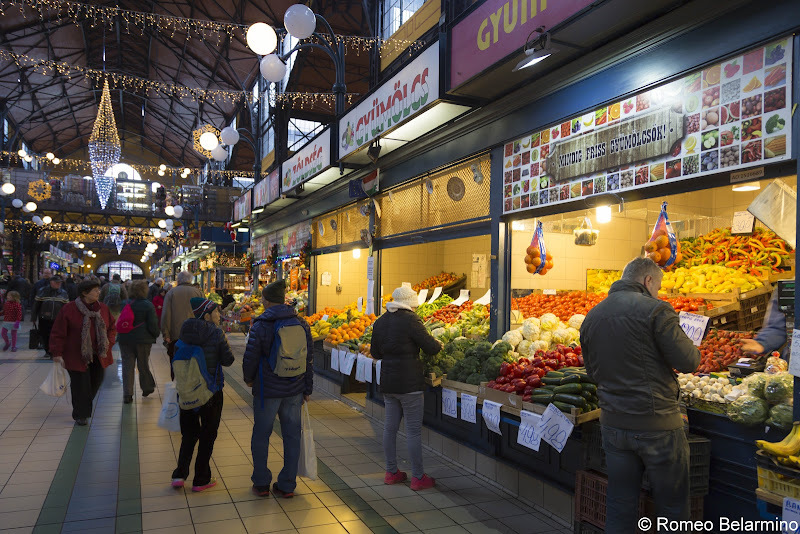 The Great Market Hall has been supplying the people of Budapest with their groceries for over 100 years. This large indoor market is a must visit for travelers who like to eat local food or like to shop. The main floor is where you’ll find fresh vegetables, cheese, sausages, and pastries. Downstairs in the basement is where you’ll find butchered meat and fish. The top floor has a restaurant, lots of food stands, and stalls selling gifts, purses, and more. 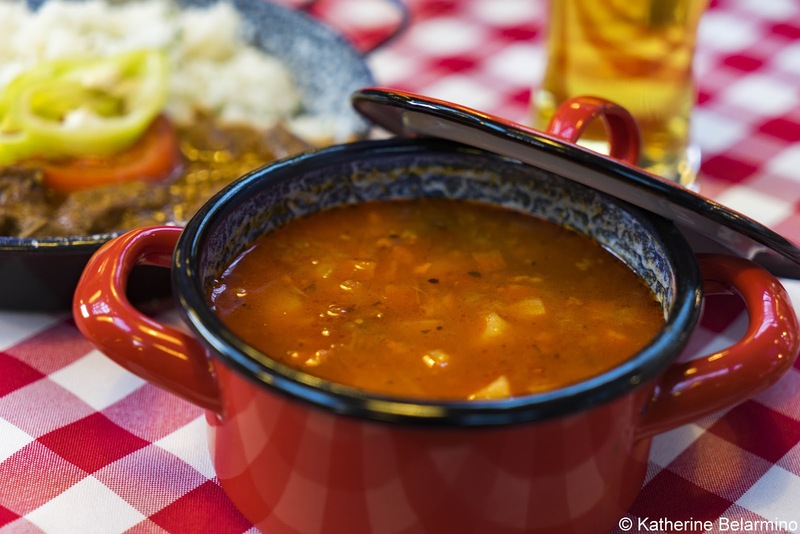 You can buy a bowl of goulash (pronounced guyash), lángos (a deep fried flat bread topped with garlic, sour cream, and cheese), or a savory or sweet strudel. For a more relaxed dining experience, you can eat at Fakanal Restaurant. I had a bowl of goulash and Rome had a bowl of Hungarian beef stew. Wash it all down with a Hungarian beer and you have a perfect meal. 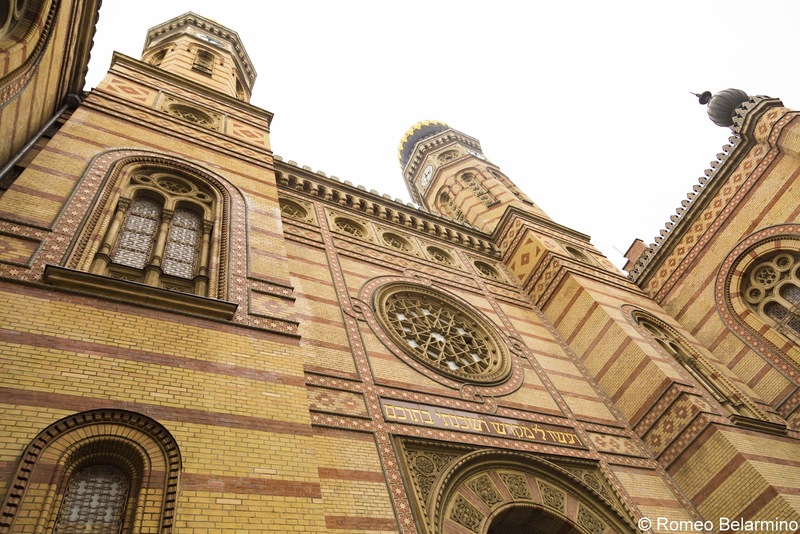 The Dohány Street Synagogue was built between 1854 and 1859 to belong to the Pest Jewish community. At the time, it was the largest Jewish place of worship, seating 3,000 people. It is now the third largest synagogue in the world and the largest in Europe. The synagogue was designed by Viennese architect Ludwig Förster, but the Ark of the Covenant was designed by Frigyes Feszl, a Hungarian architect. Services are accompanied by organ music and a choir. Rabbis deliver sermons in Hungarian from the front of the synagogue. We were told that the type of Judaism practiced in this synagogue is of the more liberal and progressive kind and that some Orthodox Jews view the Dohány Street Synagogue as a very Christian church-like synagogue. Behind the Dohány Street Synagogue is the Raul Wallenberg Memorial Park. 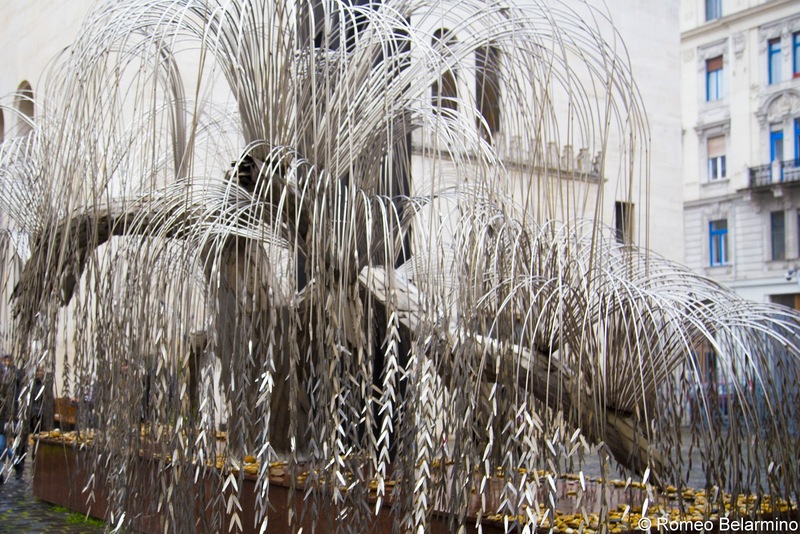 In this park is the Holocaust Memorial, a weeping willow tree with the names of Hungarian Jews who were killed during the Holocaust inscribed on each leaf. This memorial, also known as the Emanuel Tree, was sponsored by the Emanuel Foundation of New York, a foundation created by the actor Tony Curtis in honor of his father, Emanuel Schwartz, who emigrated from Hungary to New York in the 1920s. There is also a memorial to non-Jewish Hungarians who saved Jews during the Holocaust. 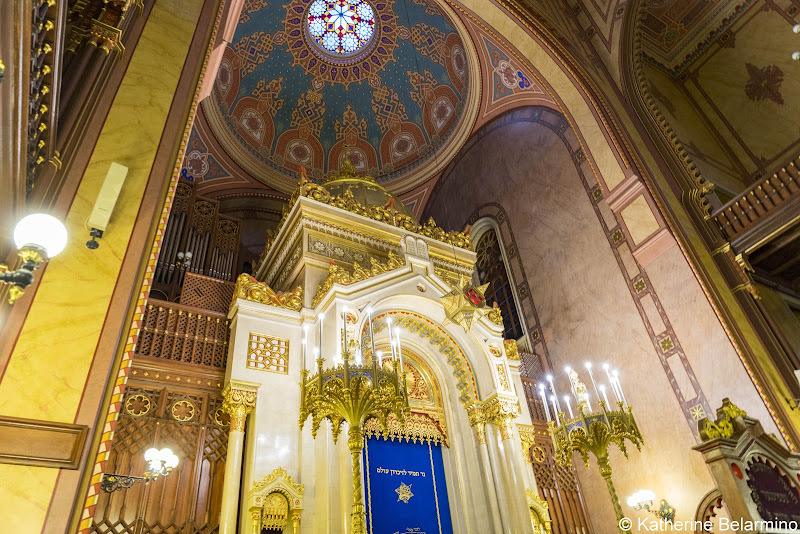 A visit to the Dohány Street Synagogue can also include the Jewish Museum, which tells the story of Hungarian Jews, the Heroes’ Temple, and the Jewish Cemetery where Jews who died in the Jewish ghetto during World War II are buried. 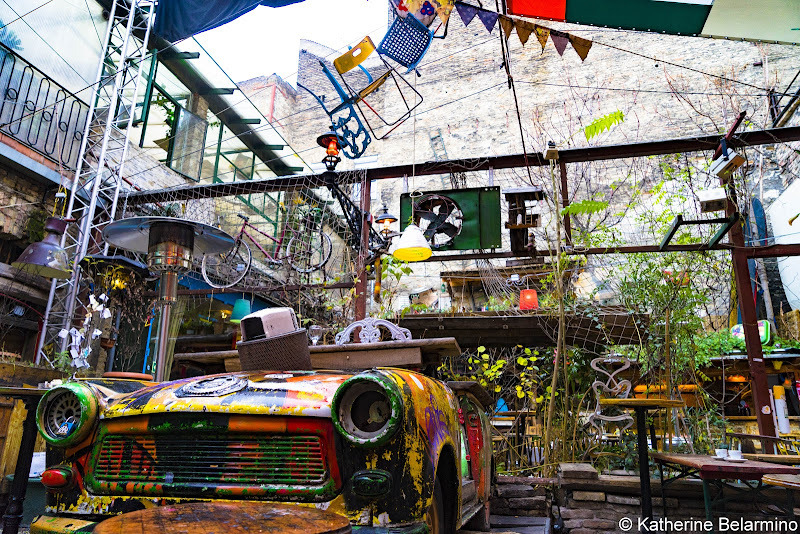 If you’re looking for a unique drinking experience, visit one of the ruin bars in Budapest. So many of Budapest’s Jews died during the Holocaust, and many more left the ghettos when they opened after World War II. This left a number of abandoned buildings and spaces. Those abandoned buildings were fated for destruction but then were saved as historical reminders and memorials. Someone decided these abandoned spaces would be perfect for a bar and gathering place, so the first ruin bar, Szimpla Kertmozi, was opened in 2002. This started a trend, and a number of other ruin bars opened in abandoned garages and gardens throughout the Jewish Quarter. Budapest has its fair share of statues you would expect to see in any European town; statues of kings, memorial statues, etc. But there are also some fun and quirky statues scattered around the city. In front of St. Stephen’s Cathedral is a statue of a roly poly policeman. The Hungarian Policeman was erected in the 1900s and it is good luck to rub his belly. Another fun statue is the Little Princess, a little girl dressed in a bathrobe for a cape and a paper crown. She can be found sitting on a railing of the Danube promenade. A statue of Imre Nagy, a Hungarian Prime Minister, standing on an arch bridge can be found at Vértanúk tere near the Hungarian Parliament Building. Another interesting statue is that of Geza Hofi, the Hungarian comedian. A skeletal figure holds his head, separated from his body, in front of the Mikroszkóp Theatre, just off of Andrássy Avenue. 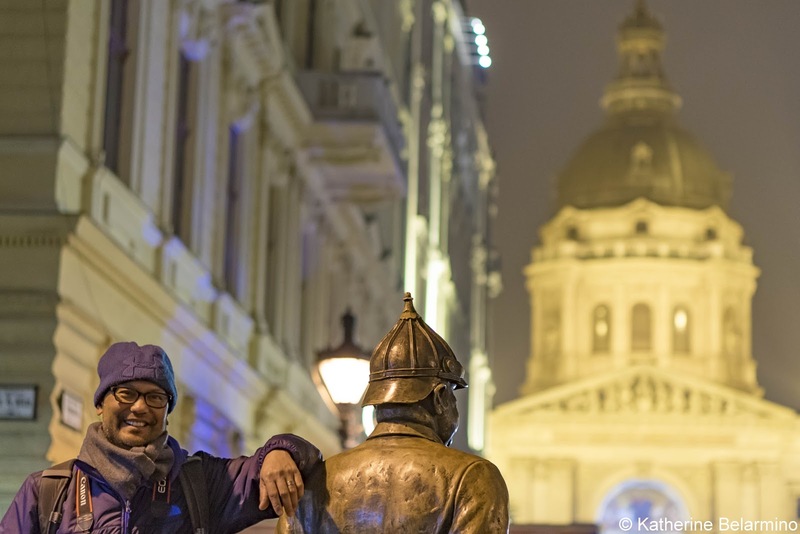 One of Budapest’s statues is far from fun, and rather is heartbreaking. 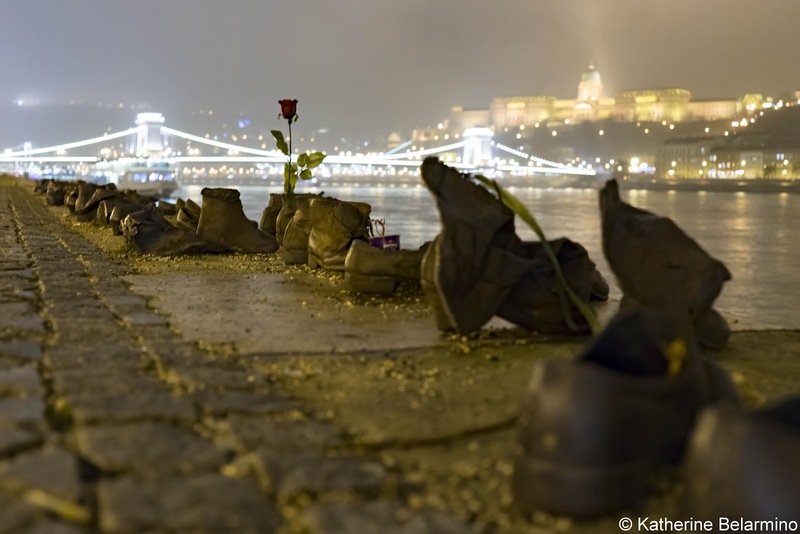 Shoes on the Danube Bank is a memorial to the Jews who were lined up along the shore by Arrow Cross militiamen during the period 1944 to 1945, ordered to remove their shoes, and then shot at the water’s edge so they would be washed away with the river current. We were told that after a while the militiamen wanted to conserve bullets, so they would tie a group up, shoot one and let the bullet go as far as it would go, and then the group would drop into the river, some still alive, to freeze and drown. One of the best ways to enjoy the views of Budapest is to take an evening river cruise so you can see the city lit up at night. If you’re on a Viking River Cruise, an evening river cruise along the Danube will be built into your itinerary. Otherwise, you can join one of the many Budapest river cruises offered, which also include dinner cruises and booze cruises. Budapest has a Ferris wheel similar to the London Eye, called the Sziget Eye. This is a mobile Ferris wheel located in Erzsébet Square. 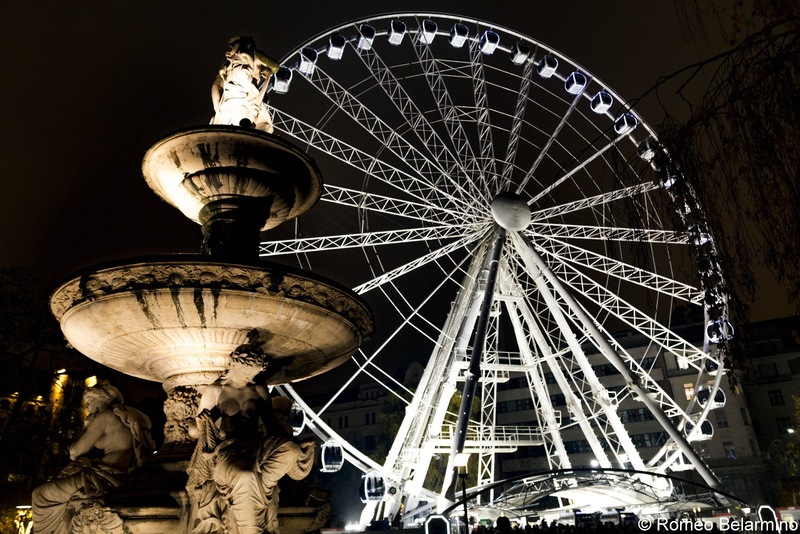 The Ferris wheel has enclosed cabins which provide an aerial view of Budapest as they make their rotation. The Ferris wheel isn’t open year round, so be sure to check the website for opening information. It is usually open spring and summer and during the holiday season. Since there are so many things to do in Budapest, we would love to return to Budapest and see more of this beautiful city. But even with just one day in Budapest, it is possible to see quite a lot and get a taste of what Budapest has to offer. Thank you to Viking River Cruises for hosting our Romantic Danube cruise, including our visit to Budapest, and making this post possible. As always, all opinions are my own.